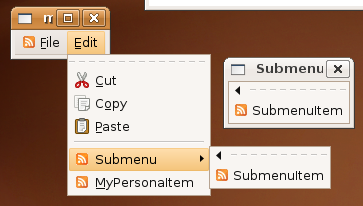 This class can be used to generate menu bars from a XML definition for PHP-GTK 2 applications. It can use customized icons, support tear off menus, separator and sub-menus. The menu XML definition can be read from a file or a string. This class was created to be used in PHP-GTK 2 with PHP 5. To see an example of how it works, take a look at 'example.php'. PHP-GTK 2 is the language binding for PHP 5 and GTK+ 2.6.x. It works independent of an Apache enviroment.